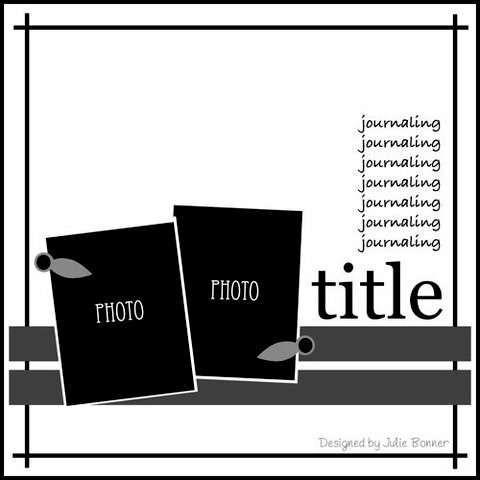 I love a good sketch challenge, so I made it a priority to do the Pick-a-Sketch challenge at Scrapbook.com. This one was unusual in that we got to pick the sketch ourselves instead of everyone using the same one. Freedom is great, but it was so hard to narrow down the choices! As you can see, I followed the sketch very closely. Other than flipping it horizontally and adding the punched heart to my title, I left everything else the same. I even used the little carrot stickers as photo turns. It was the perfect sketch to document Trevor hanging bunny art on Trouble's wall at age 5 and again at 10. Love this... the sketch(I may need to use it myself) and what you created! Love the carrot and rabbit head embellishments! Loveeeeeeeee this! LOVING those photos and loving the little carrot stickers!!!!!!!!!!!!! 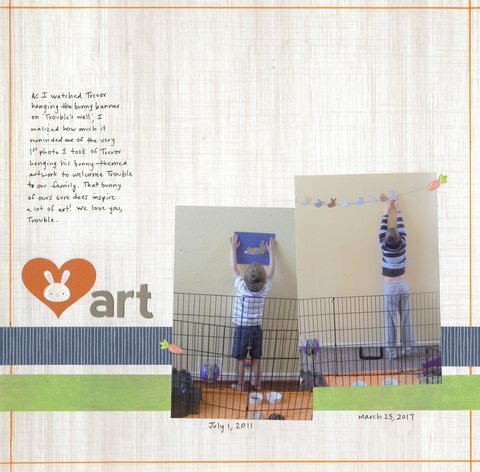 Love, LOVE Trevor's bunny art! What a great layout for NSD! How cute! LOVE those carrot stickers!